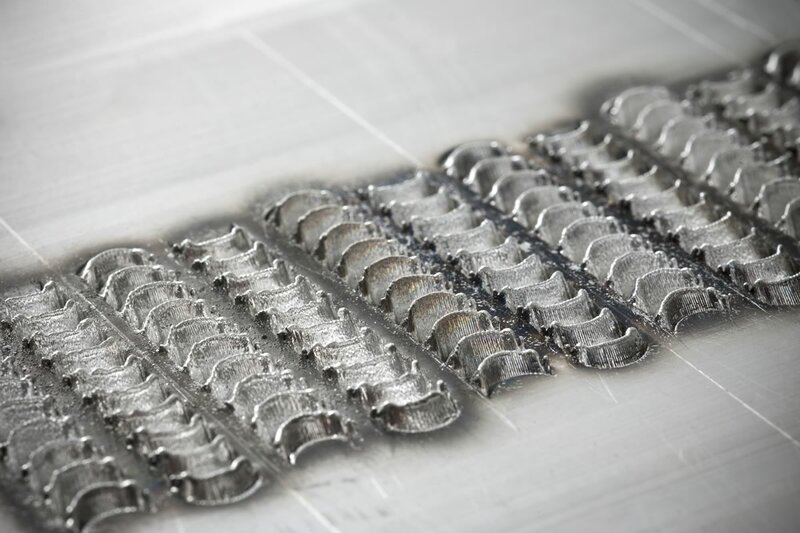 COOLTECH was the coordinator of an FP7 project looking at novel surface profiles to increase thermal exchange using a novel tehcnology, Surfi-sculpt® – to drive performance increase in heat sinks and heat exchangers. The project closed in August 2015 – see www.heatsculptor.eu – having demonstrated a thermal resistance by far lower than could be achieved with existing products. In general terms, HeatSculptor showed that the heat transfer coefficient could be increased by approximately a factor of two compared traditional technology. New trends in power electronics industry are heading to miniaturization, integration and frequency increase which produce higher power dissipation rates to be dissipated, together with the need for efficiency increase in the system. In this framework, two-phase passive thermosyphon technology represents a promising solution thanks to the high cooling capacity, the reduced operational and maintenance costs and the flexible geometric configuration. Prior to designing an optimized two-phase loop thermosyphon device, the thermal and fluid flow characteristics of evaporating and condensing flows were experimentally investigated, for different operating conditions, evaporator and condenser geometries. A two-phase loop thermosyphon consists of a closed system, vacuumed and partially filled with a working fluid. The working principle of a two-phase close loop thermosyphon is shown in Figure 1. The self-sustained fluid motion is produced by the density difference establishing when the fluid is simultaneously evaporating and condensing at precise locations in the device. 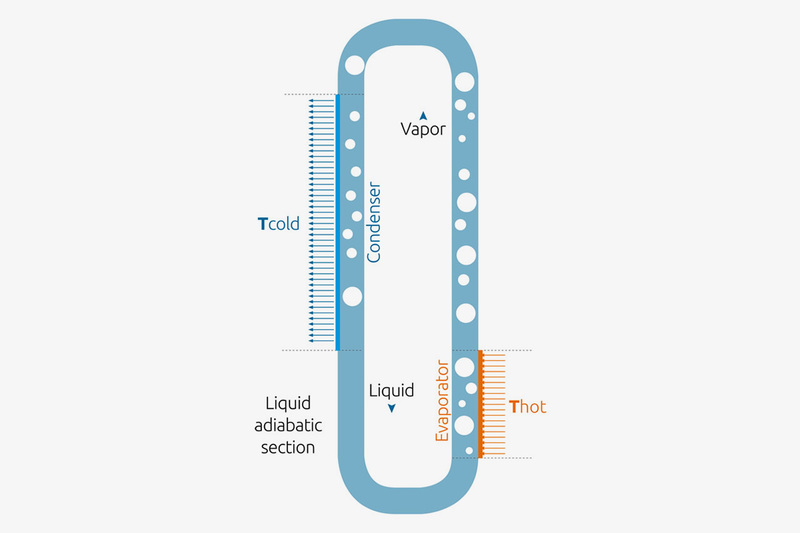 Heat is supplied at the bottom of the device (in the evaporator), where the refrigerant changes of phase and rises in a two-phase adiabatic section (tube) until the liquid-vapor mixture reaches the condenser (placed at the top of the system). Here the latent heat is released, producing the condensation of the refrigerant that, through a second adiabatic section, returns to the evaporator, where evaporation occurs again, driving the passive, gravity driven flow-motion. The thermal performance of such systems has been widely investigated experimentally and consistent models of the heat and mass transfer have been produced [1-8]. Generally speaking thermal resistance of the closed loop thermosyphon was seen to depend on the geometry and orientation of the loop, working fluid and the quantity charged in the loop (filling ratio), heat flux and cooling temperature [1,4-8]. In particular, the performance of the system was observed to be strongly affected by the geometry of the evaporator and by the resulting evaporating mechanisms. It is well known that nucleate boiling and flow boiling show different characteristics in terms of heat transfer; same for macro- and micro-scale flow boiling . It is therefore clear that, prior to any modeling of the thermal and fluid flow behavior in a closed loop thermosyphon, local heat transfer coefficients in the evaporator and condenser, together with local pressure drops developing along the whole loop must be empirically investigated. COOLTECH today can include in its portfolio a possible solution using the thermosyphon principle, contact us for more informations.